My name is Martha and I want to take the yuck out of one of the most important – and often overlooked – business growth activities. Gathering testimonials seems like one of those “no-brainer” marketing tasks. And yet, most of the small business owners I work with NEVER do this! Never!! It’s a little embarrassing to ask someone to say nice things about you. You do ask, but your clients take forever to get around to writing a testimonial. So now you have to nag them. Yuck. The last time a client wrote a testimonial for you, it was so badly worded you didn’t want to use it. Awkward. You’re so busy with everything else, you just never seem to get around to it. Credibility. Hands down, the words of your happy clients are THE best marketing device you can employ. We simply believe another person’s sincere touting of a business more than anything the business may say on its own behalf. Proof. Your clients’ kind words about you are evidence of your claims that you are the best in your area of expertise. If you want to expand your audience and attract new prospects who don’t already know you, you must have a way to prove that you know your stuff. Better Clients. That’s right – when you display testimonials from your wonderful, ideal clients, you will attract more just like them. Like attracts like, remember that rule? Stronger Relationship with Current Clients. As they reflect on why they like working with you, and then publicly articulate those reasons, they are deepening their commitment to your company. The process itself will build a stronger bond. Stories that Sell. Facts can be boring to most of us, but we are always pulled in by a good story. Your client testimonials are just that – mini stories about your business. A great story is much more likely to compel a prospect to buy from you than a bullet list of facts. I know you don’t want to miss out on these rock-solid business growth benefits! Listen, I’ve been in marketing for more than 25 years. (I added coaching to the mix 16 years ago.) Techniques come and go. Concepts come and go. Tools come and go. But testimonials have always been – and will always be – one of THE most vital elements of your business growth strategy. Over all those years, I’ve gathered hundreds of testimonials for professional services clients covering many industries – consulting, architecture, engineering, accounting, technology, insurance, construction, associations, and coaching. After much trial and error, I developed a process that has been 100% successful in terms of getting great testimonials from even the most hard-to-reach clients. I use coaching skills too – this is the secret sauce for testimonial success! My process has been so successful, I was invited by PKF North America, an association of accounting firms, to conduct an instructional webinar for its member firms. That class was so successful they asked me back for a command performance two years later. This process really works! Frankly, I’m tired of watching business owners struggle with this tool. So I’ve written a step-by-step guide to gathering snappy testimonials that will bring you more clients. Actually, it’s more than a guide – it’s a toolkit, with detailed instructions and ready-to-use templates for you to communicate effectively with your clients. 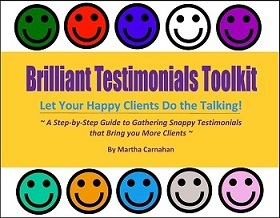 Whether you are a do-it-yourselfer or if you hire this task out to an assistant, everything you (or your assistant) needs is contained in this Brilliant Testimonials Toolkit. You’ll get a 21-page ebook containing step-by-step instructions for my tried-and-true process. It’s not the kind of book you just read – it’s the kind of book you take action on. If you download the Brilliant Testimonials Toolkit right now, you can begin expanding your inventory of testimonials in a matter of days! Inspiration to put this on your front burner, ASAP! Resources to ensure that you use testimonials legally – the U.S. law changed recently and you don’t want to get yourself into trouble with the Federal Trade Commission! 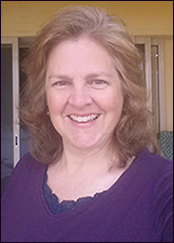 ~ Laura Overstreet Biering, MM, CPCC, PCC, Authentic Life & Leadership Coach, True Voices, Inc.
You are already paying a price if you do not have a good set of testimonials working for you — you are losing prospects. How much is each potential client worth to you? Hundreds? Thousands? Well, it would be a no brainer to get your testimonial-gathering process up and running for just $21. My reviewers told me I priced it too low. And then I went and ignored their advice and lowered it even more… to just $16 bucks. At least for now. I want to make it easy for you to say “yes”! If you haven’t created better testimonials, with a smoother process… just ask me for your $16 back. Just send me an email and say, “Hey Martha, it turns out that this is not really for me.” And that’s all it takes to get your refund. No risk. Safe and painless. 100% guaranteed. This e-book will give you a smoother, more effective and growth-fueling process for gathering power-house testimonials for your business. Grab it while it’s hot! P.S. My goal is ultimately to help you build a thriving business without squeezing the life out of your life! Putting this easy-to-use, fail-safe process for gathering testimonials in place should be at the top of your list. Take testimonial gathering off of the back burner and put it smack dab in the heat, right now! P.P.S. Money-back guarantee makes it impossible to pass up this offer!